A sparkly crystal teardrop pendant with a moonstone, pearl and a blue topaz teardrop and matching earrings. To add some sparkle to your day. A sparkly 12mm Crystal faceted teardrop is handwired with a stunning faceted moonstone rondel, a fabulous freshwater pearl and an absolutely gorgeous highly faceted blue topaz teardrop. 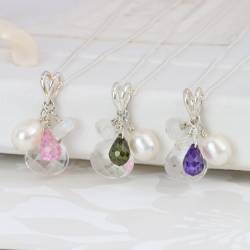 This is the perfect pearl and crystal necklace and earring set for a gift to any woman as you can find the colour that she loves to wear. Sterling Silver, rock crystal, moonstone and blue topaz (small teardrop). The clip on earrings are silver plate, all other earring fittings are sterling silver. The chain has a silver extension chain so the shortest length is 16"/ 40cm but it extends upto 18"/ 45cm. Length of pendant approx 2cm. The length of the drop is approx 20mm on studs and 35mm on fish hooks.